To the ordinary species—that includes you and me—swimming 1.9 kms., biking 90K, then running a 21K is crazy and impossible. It takes a body made of iron—plus a brain that’s ironclad—to finish the Ironman 70.3. One such man is Dr. Raymund Reel Bontol. 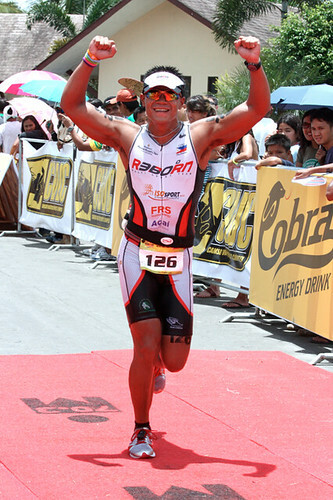 A marathon runner with the physique of a Daniel Craig, Doc Reel joined the Cobra Ironman 70.3 event in Camarines Sur last Sunday. 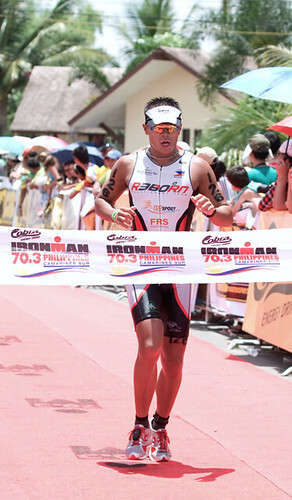 Among those representing Cebu included last year’s top Filipino finisher, Noy Jopson. Also joining were Elmo Clarabal, Ralph Martin Sios-e, Eugene Sanchez, Trino Trasmonte, Ralph Arche, Tyrone Tan, Kristian Cabahug, Frederick Pahanonot, Jose Ricardo Dizon, Siegfred Zarex Tura, Bro. Carlo Bacalla and Cleve Villanueva. 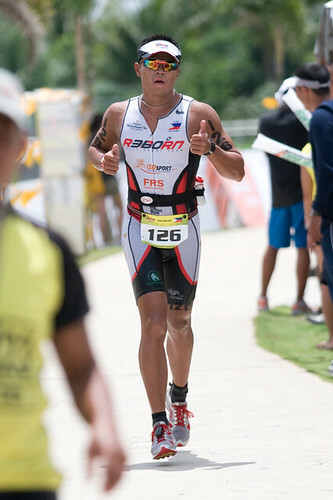 “My legs had over three years running experience when Noy Jopson convinced me to join the Ironman. He taught me swimming and cycling techniques necessary for long-distance triathlon. Despite my panicking during the swim and weakness on the bike, I was always atoned by my running skills. In every race I pray that I reach the run leg for me to be assured of the finish. “Training was not easy. No wonder Noy is a great athlete. TEAM REBORN trained with him 12 weeks prior to the Cobra Ironman race and we were always drained after every session. He is strict. We never let Noy see us slacking off. Disciplines include swim training, cycling, running, gym-training, core training, yoga/Pilates sessions. Hot weather in Camsur was expected so we trained at least twice a week at noon. 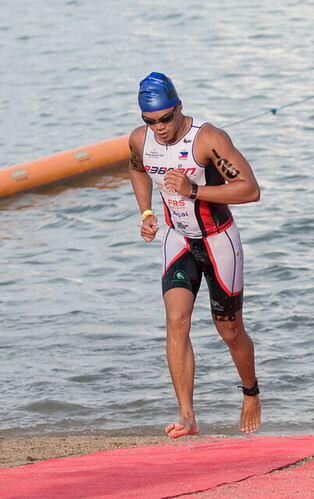 “Unpredictable moments are common in multisport races. I suffered from colds and cough two weeks before race day. It was getting worse. I also started having loose bowel movements five days before the race—which made it difficult to hydrate and carbo-load. I was getting anxious and panicky. I loaded myself with all types of medications and prayed to be healthy. “It is a custom for Cebu Executive Runners Club (CERC) members to attend mass a day before the race. I had to thank God for all His blessings—plus it was the perfect time to ask for good health. With fellow Team Reborn and CERC member Annie Neric and her husband, Jet, we attended mass. With my condition, I prayed hard that I would survive the race. “Out of the water I then proceeded with the bike leg. Despite the course being traffic-free, cycling accidents happen. Whenever I can, I prayed the rosary—a practice I kept while running marathons. After pedaling 90 kms., I was now in my comfort zone. However, running 21 kms. under extreme heat after swimming and cycling is not easy. Cramps and dehydration set in while muscle fatigue ruin your running form. After two loops of the run course, the finish line was visible. ‘Three kilometers to glory!’ I told myself. With friends cheering and the booming voice of the announcer, my heart beat faster.